BeritaDEKHO - Indonesia and India have agreed to form a comprehensive strategic partnership based on their shared vision on maritime cooperation in the Indo-Pacific region. 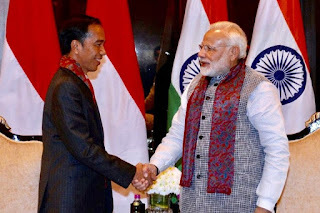 In a joint statement issued after a meeting in Jakarta on Wednesday (30/05), President Joko "Jokowi" Widodo and Indian Prime Minister Narendra Modi said the two countries shared interests, similarities and proximity as maritime neighbors in realizing a common future. "Both leaders agreed to strengthen cooperation in all areas by establishing a new comprehensive strategic partnership to take Indonesia and India's bilateral relationship into a new era," said the statement, issued by India's Ministry of External Affairs. The two countries plan to strengthen cooperation in defense, security, economy and people-to-people relations through exchanges with relevant stakeholders in the aforementioned areas, while also addressing several issues to improve effectiveness, such as connectivity, infrastructure and trade barriers. "Let us welcome this comprehensive strategic partnership by working harder to realize mutually beneficial relations," President Jokowi said, as quoted in a separate statement issued by the Cabinet Secretariat. Jokowi and Modi also agreed to intensify their efforts to conclude negotiations on the Regional Comprehensive Economic Partnership (RCEP), which is expected to be ready this year. The RCEP consists of the 10 member states of the Association of Southeast Asian Nations (Asean) and six of the regional bloc's free-trade agreement partners, namely Australia, China, India, Japan, South Korea and New Zealand. Member states of the RCEP represent almost half of the world's population, 31.6 percent of global output and about 28.5 percent of global trade, with the partnership expected to support job creation and promote innovation, among others. Indonesia and India have also seen steady growth in bilateral trade. Indonesia is India's largest trading partner in Southeast Asia, with total bilateral trade valued at over $18 billion in 2017. India is Indonesia's top export market for palm oil and the second-largest importer of coal from the archipelago. Noting the important role of palm oil in their bilateral trade, the two leaders also agreed to address obstacles in trade and investment in palm oil products and industries, the statement said. Furthermore, the two leaders also discussed energy affairs and agreed to boost cooperation to promote the use of technology in energy efficiency, renewable energy and energy security, with the ultimate goal of replacing fossil fuels and meet their respective targets to combat climate change. Jokowi and Modi also witnessed the signing of nine memoranda of understanding between their two governments on cooperation in various areas, including defense, health and pharmaceutics. According to the statement, Jokowi and Modi believe their shared vision on maritime cooperation "can be a force of immense stability in the region." As part of an effort to promote maritime safety and security, the two countries agreed to strengthen existing security architecture in the Indo-Pacific region through Asean-led mechanisms and also within the framework of the Indian Ocean Rim Association. Both countries are members of the East Asian Summit, an Asean-led mechanism comprising 18 countries, which was established in 2005. Indonesia and India also plan to conduct regular bilateral naval exercises and continue coordinated patrols, which were established in 2002. They further agreed to enhance the exchange of information on maritime security in the Indo-Pacific region. Cooperation in the Indo-Pacific region is part of both countries' foreign policy priorities this year. This cooperation includes efforts to enhance trade and investment, promote sustainable development of marine resources, promote tourism, expand cooperation in disaster management and enhance cultural, academic, scientific and technology exchanges between the two countries.